Karen Witemeyer is no doubt one of my favorite historical fiction authors to read. She writes novels that are well-paced, full of charming characters, and story lines that leave you turning the pages long into the night. 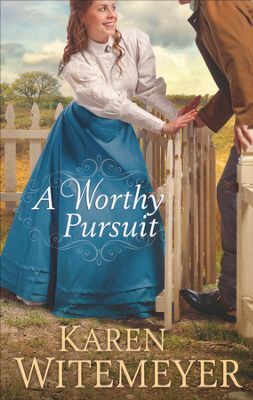 A Worthy Pursuit is another wonderfully written story that reminded me why I love reading her books. In A Worthy Pursuit, Charlotte Atherton is headmistress of a prestigious school and caretaker of several of its pupils. When the school suddenly closes, she fleas in the middle of the night to protect one of her charges from a less than desirable relative. With two other students in tow, Charlotte goes into hiding. It doesn’t take long for a former bounty hunter (Stone Hammond) hired to find one of students to locate Charlotte. However, Stone quickly realizes he is on the wrong side of the fight. I loved this book for several reasons, but mostly for the strong and likable characters of Charlotte and Stone. While Stone is super masculine, he doesn’t fit into any stereotypes often found in fiction. Charlotte is feminine, but she also is independent and intelligent. I really enjoy the way Witemeyer gives her would be pair plenty of page time and dialogue to form a believable relationship. Further, this story is full of action and offers more than just a love story. I am so glad I had the opportunity to read another Karen Witemeyer novel. I have never regretted reading one of her books! I was given a complimentary copy of this book by its author in exchange for an honest review. All opinions are my own and I have not been compensated.